Experiment name: Produce a collar & cuff of a basic shirt by using fusible interlining. Interlinings are used to support, reinforce and control areas of garments such as collars, hems, facings and the fronts of jackets and coats. They may be sewn into the garment or they may be attached by means of fusing. Although fusing is now very common as a method of garment construction, there are many fabrics which are not suitable for fusing, as well as the small manufacturers who do not have the requisite equipment. The complexity of interlinings used varies greatly between tailored wear, especially menswear, and other types of garments. To produce collar and cuff of a basic shirt. 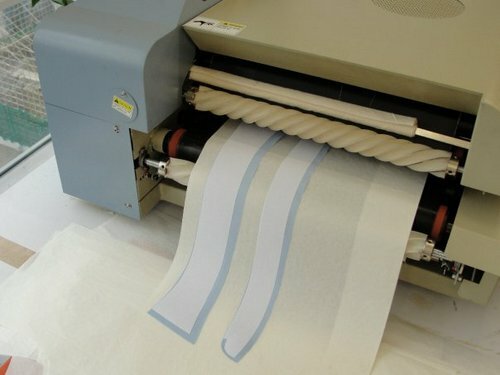 To know how to use fusible interlining. To know about how to sew the collar and cuff attached fusible interlining. At first we made the pattern of collar and cuff. Then we cut the fabrics according to the pattern design. After cutting two pieces of fabric for collar was taken and similarly two pieces of fabric for cuff was taken. Then, interning for collar was taken and placed on one part of the collar fabric. Then that interlining was joined by proper heat. After that, another part of collar fabric was joined with that interlining part and then by sewing we got a complete collar part for a basic shirt. Similarly, we get a complete part for cuff of a basic shirt. During this experiment we faced some minor problem, like unavailability of sewing machine. Moreover there occurred a huge gathering in interlining section, which killed a lot of time. Interlinings are available in a wide variety of weights and construction to match the properties of the garment fabrics they will support. They can be woven or non woven, both of which can be constructed to give a different softness or resilience in different directions. And our teacher helped us properly to get a proper knowledge about that interlining. And this knowledge may be very helpful in our future industrial life.